Its best to speak to one of our project advisor’s prior to sending anything in so we know to expect it and can also discuss any lead time requirements you have. We have tried to make ordering as simple as possible, there are certain details that we do need form you though in order to set the project up on our systems this is why we need you to complete the Order Details Form. 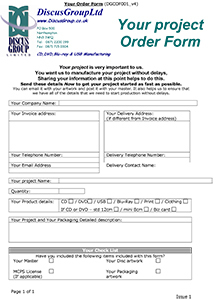 By ensuring you supply the information on the order form and artwork using our templates your job will be processed faster ahead of other jobs. You can find the CD / DVD artwork templates on our Artwork Template Page. If greater than 5MB we recommend using a file transfer site such as www.wetransfer.com. Artwork should be supplied in PDF format on the templates and set up as 300dpi and CMYK. If you are unsure about any of this please contact one of our advisor’s for assistance. Ideally we would prefer to receive a physical master of your disc. You can then check this disc prior to sending and we can make identical copies. We appreciate this is not always possible so as an alternative we can work from DDP 2.0 masters for replication projects, these must be supplied with a MD5 checksum so we can verify there has been no corruption in the transfer process. Physical masters should be sent to the address below. Please ensure you include either the printed Order Details form or contact information so we can identify what project the master is for and who to contact. Please contact us if you need a non PO Box address, for example if sending by courier. Always check the disc in and audio CD player (not just a computer). If supplying RAW files we will need to create a master CD or DVD before we can copy. We also prefer to send a proof copy for approval prior to production. There is a small fee for creating the master. If you would prefer for us to proceed without a proof or if there is not sufficient time to send one then we will need written authorisation absolving us of responsibility for the content.